Guppy fishes are one of the most popular of aquarium fish species. They don’t cost a lot in comparison to other fish found at your pet stores, although some rare Guppy breeds may be expensive. Guppies come in many different colorful variations that can be collected and easily bred. They are great for beginners and children who are looking into getting started with owning an aquarium. Guppies are Livebearer fishes so they give birth to live fry. Guppies originated from northeast South America and were introduced to many habitats are now found all over the world. Although Guppies are easy to care for and they are fairly hardy fishes, they still require proper care and conditions. With proper care, Guppies can live as long as three years. Appearance: Small and elongated fish. Females are bigger than males. Males are more colorful and slender. Size: Males grows up to 1-1/8 inches (3 cm), Females grows up to 2-1/8 inches (6 cm). Tank: At least 5 gallons (20 L), 10 gallons (40 L) or larger recommended. Aquarium tank cover is recommended. 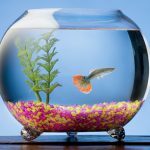 Guppy Fish Diet — What to Feed Guppies? Guppies are omnivores and should be fed both meat and a vegetable diet. You can feed your Guppies processed foods like flakes and pellets as well as live or frozen dried foods such as Bloodworms, Brine Shrimp, Mosquito larvae, White Worms, etc. You can also try feeding them fresh vegetables such as tomatoes, spinach, lettuce, etc. You should consider giving them smaller feedings twice a day rather than one large feeding once a day. If they’re still fry (baby Guppies) or juveniles, then give them several feedings throughout the day since their stomach is much smaller and their metabolism works fast. While Guppies and other fish love to eat live foods like Brine Shrimp, don’t only feed them live food since it can result in nutritional deficiency. Live foods like Brine Shrimps are high in protein but low in other nutrients. Brine shrimp eggs, which you can hatch, are available in most local fish pet stores or you can also purchase them online. Guppies should finish eating anything you give them within a couple of minutes. Removed any uneaten food that has been left over otherwise they will pollute your water. Feed them two times a day, six days a week. Let your fish starve one day per week, this helps them empty their digestive system which helps lengthen the lifespan of any fish, not just Guppies. There are different variations Guppies, differentiating in the tails, the fins, the colors, and the patterns. There are many new ones being introduced by Guppy breeders all of the time. It is very important to have properly setup aquarium for Guppies. A properly setup Guppy aquarium tank doesn’t require a lot of your time, Guppies and fishes can be the perfect pets for people who are busy. Unlike dogs, it doesn’t require a lot of energy to be fish owners. Guppies are among the easiest fish to keep, as they are hardy and tolerant of a range of water conditions. Guppy can tolerate water pH range between pH 5.5-8.5 and their most desirable range is between 7.0 and 7.2. A fish bowl is not sufficient, as they are not big enough and you can’t properly setup heaters, lighting, filters and other essentials for your Guppy’s needs. There are a few things to note that you should take into consideration when setting up your aquarium. Temperature — It’s important to have an aquarium heater for your Guppies so the temperature doesn’t constantly fluctuate. Guppies do best in water that is kept anywhere from 75 to 80°F. If you are trying to grow Guppy fry faster, raise the temperature a little bit, but never over 85°F. This helps speed up their metabolism so they will eat more. Lighting — Guppies requires proper aquarium lighting to grow healthy and to bring out their vivid colors. Guppies that live in dim lighting can form deformities in their spine. But too much lighting can also be bad for your Guppy’s health. Guppies, especially fry will need at least eight hours of darkness each day. 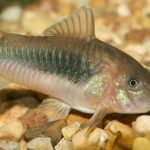 If the light is never turned off, your Guppies might not be able to get the rest it needs and it can actually kill your fish since it can never properly rest. TIP: You can buy a “timer” for your lights so that it can automatically turn on and off at the same time everyday. Filtration System — There are many different types of filtration systems on the market to help maintain your aquarium tank’s water clean. When the filter media starts turning brown, it’s time to replace them. Never fully replace all the media at once because beneficial bacteria has been cultivated to help biodegrade the ammonia in the water created by the fish waste. Cut the filter media in half, and replace the other half with the new media material. Air Pump — While your fish are water-dwellers, they still need oxygen to live. The air pump will pump out bubbles into air stones to help create oxygenated water and help water move around in your aquarium. You can also plant live plants to help produce oxygen as well. Decorations — Decorating your aquarium tank can be fun, as a bare tank might not look very nice. There are many different types of decorations you can buy. Some even hooks up to your air pumps to produce interesting actions like a treasure chest opening or a shark opening and closing its mouth. 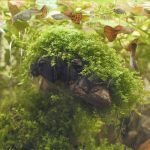 You can also put substrates like sand or gravel at the bottom of the aquarium tank, which allows you to place both plastic and live plants in the gravel. Creating hiding spots is important if you’re breeding your Guppies, their fry will need places to hide from their hungry parents and tank mates. Once a week, you should change about 25% of the water in your aquarium tank. It’s important to use a vacuum siphon hose if your aquarium tank has any bottom substrate to help remove any uneaten food and fish waste. With regular aquarium cleaning and water maintenance your Guppies will remain healthy. When doing water changes, replace it with water that has been left to stand for at least 24 hours to let the chlorine dissolve. You should use a pH kit to ensure that your Guppy’s water is within the range of pH 5.5 to 8.5, ideally their most desirable range is between 7.0 and 7.2. Stocking – How Many Fishes Can I Keep in This Tank Size? While Guppies are social fish and likes to swim in shoals, you don’t want to overcrowd a tank. The general rule of thumb with fish and tank size is one inch of fish per gallon. For example, if you have a ten-gallon tank, then it can accommodate five adult Guppies. You must consider the size the fish can grow up to, not the length when you buy them at. Most Guppies can grow up to about two inches long. When you’re planning on buying an aquarium tank, it’s always a good idea to buy the largest tank possible to avoid future overcrowding. A larger aquarium tank’s water quality is typically easier to upkeep when it comes to maintenance. Guppies are a peaceful species fish and will happily co-exist with similar sized fish but avoid adding any fin-nippers as tank mates since a male Guppy’s elaborate fins makes them easy targets. Almost all Livebearers like Ender’s Livebearers, Mollies, Platies and Swordfish can co-exist peacefully with Guppies. Other fish that can co-exist quite peacefully with Guppies includes Cory Catfish, Glass Fish, Ghost Shrimp, Neon Tetras and even African Dwarf Frogs. 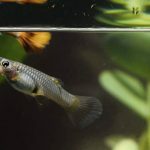 Male and Female Guppies – What are the Differences? Distinguishing between a male and a female Guppy is easy. Male Guppies are smaller than the females are, males can grow up to 1-1/8 inches (3 cm) in length while females can grow up to 2-1/8 inches (6 cm) in length. They are easiest to distinguish by their tails since male’s tail are much more colorful and have longer tail than females do. A male’s body is also much more colorful. Guppies that have reached their reproductive cycle will often reproduce on their own without any special care or encouragement from their keeper. 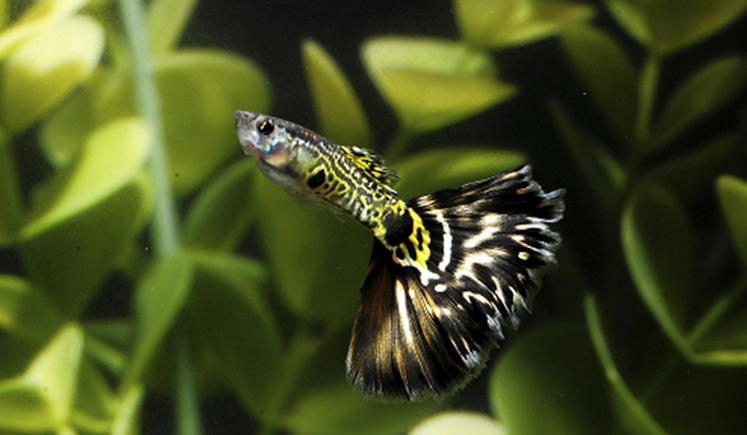 Guppies who are pregnant will develop a black spot behind their belly (near the tail) called the “gravid spot”. As the female Guppy is closer to giving birth, the spot will become larger and darker. They typically give birth within a month when you notice they’re pregnant. Monitor her closely when she is about to give birth since you will have to separate the fry to a separate aquarium tank away from the mother and her tank mates before they eat them. To increase the survival chances of your fry, you can place dense live or plastic plants to act as hiding spots for the fry. Alternatively, you can setup a separate breeder tank with a breeder box to place the pregnant Guppy in it, if you want to save most of the fry. A breeder box has holes for the fry to swim to the other side and acts as a separator to prevent the mother from eating them. Once the mother have given birth to all her fry (sometimes it can take them up to 24 hours before releasing them all), you can return the mother Guppy back into her main aquarium tank. TIP: Only place the female Guppy into a breeder box, 1 week before she’s about to release her fry. Otherwise it will stress her out and cause a miscarriage. 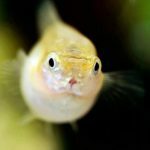 Keep the water in your Guppy fry’s aquarium tank clean since their immunity system isn’t as strong as an adult Guppy’s. Guppy fry need to be fed often because of their fast metabolism and smaller stomach, so feeding them several small meals instead of two large meals throughout the day will encourage them to grow faster. Guppy fry should be about 1-inch (2.5 cm) in length before being introduced into an aquarium with the adult Guppies. For a more in-depth detail to breeding Guppies and Guppy Fry care, read our Breeding Guppies and Livebearer Fishes Guide. Guppies are generally a very hardy fish species but their long tail makes them prone to fungal infections. One of the common diseases that Guppies are prone to is Ich — small white dots on the fish’s skin and fins that makes the fish want to rub their bodies against objects. 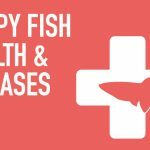 Read through our Guppy Diseases and Treatment article to learn more about common Guppy Diseases and how to prevent diseases. To proactively prevent your Guppy fish from catching diseases, keep your aquarium tank’s water clean, make sure to give them a varied diet and their aquarium tank is not overcrowded. Overcrowding is probably the worse culprit in causing fish diseases because it’s hard to maintain the aquarium tank’s water quality with more waste. It also adds stress to the fish, which lowers their immune system to fight off diseases. When adding anything to your aquarium tank, make sure you don’t bring in any disease. Any fishes, plants, substrate and decorations can all contain harmful bacteria and parasites. Take great care and make sure to properly clean and/or quarantine before adding anything to an established tank.